Perennial herbaceous plant horseradish (Cochlearia armoracia), whose original homeland is considered Southeastern Europe and Western Asia, is full of useful ingredients. Horseradish is a perennial plant of the Brassicaceae family. It is a root vegetable used as a spice. In the food pyramid horseradish is classified as very useful vegetable, and its fresh root can be used throughout whole year. The leaves contain a remarkable amount of minerals potassium, calcium, phosphorus, sulfur, magnesium, chlorine. On the other hand, underground shoots are used as a spice and added to various foods, especially meat. In addition to a beneficial effect on the digestive organs, consuming horseradish is useful for the sick and gums, as well as to eject phlegm from the lungs. It was found also that the ingredients from horseradish root prevent bacteria. Root is taken out from June to November, while the leaf harvested from May to October. From nutrients root contains carbohydrates, proteins and fats. It also contains an impressive amount of vitamin C, as well as glycoside, glutamine, glucose, potassium acid sulfate, essential oils and, of course, mention singrin. In a sealed container in the refrigerator it may be stored up to six months, and in the freezer for longer. When preparing should not peel thinly, so that he removed only bark, and before rendering the root should be left for 24 hours in order to take advantage of all the valuable ingredients. 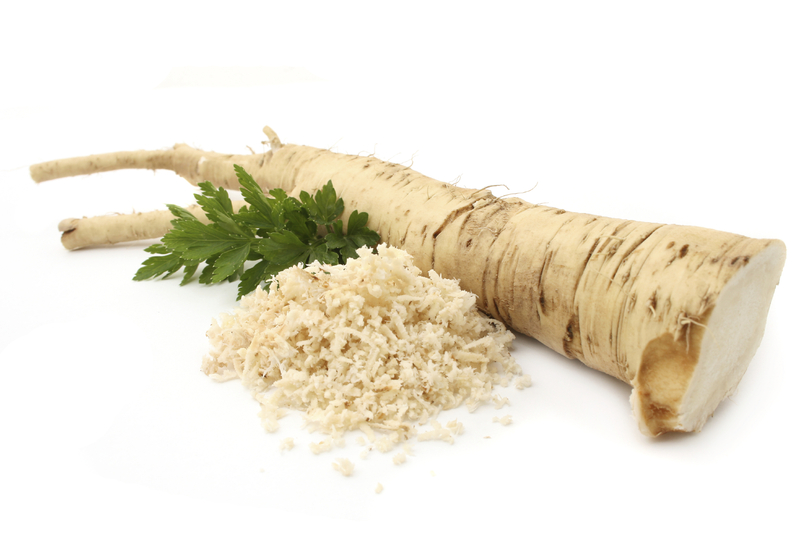 Horseradish cleans the body and speeds up the metabolism, which is why it needs to be eaten more often, and this is particularly true for diabetics, but also those who constantly feel tired. Specific keen smell and taste comes from the ingredient singrina and horseradish contains coumarin, phenols, essential oil, asparagine, peroxidase, resin, starch and saccharides. For all of these components of traditional medicine experts recommend it as a remedy for immunity, cough, bronchitis, asthma, rheumatism. It is also used as a remedy against clogging of blood vessels, improves digestion, and is highly regarded as an antiseptic and a diuretic. Recommended by the eject stones and sand from the kidney, and out urine. As the drug is usually taken with acidic foods, in the form of a syrup, cooked in white wine or water, or as a tea. For some diseases are recommended and packs of horseradish.